LONDON (AP) John Isner is ready to be associated with something at Wimbledon other than winning a 70-68 fifth set in the longest match in tennis history. He figures a championship would do the trick – and now he’s only two victories away. He’d never even been past the third round in 10 previous appearances at Wimbledon, a place he called a ”house of horrors” earlier in the tournament because of all of his quick exits and five-set losses. Isner is most famous for that record-breaking victory over Nicolas Mahut in the first round eight years ago, which lasted 11 hours, 5 minutes spread out over three days. If the 6-foot-10 Isner he keeps serving the way he has been over the past 1 weeks, that’s a real possibility. He hit 25 aces and saved the only break point he faced against 2016 Wimbledon runner-up Raonic, and has won all 95 service games he’s played across five matches. 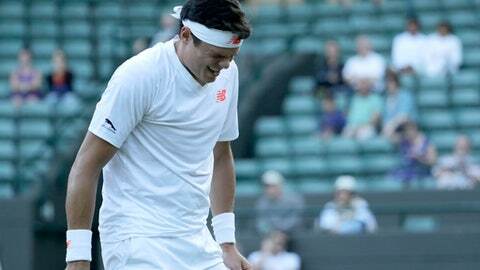 ”I didn’t have many chances,” said Raonic, who had his right thigh taped by a trainer after feeling something akin to a muscle tear in the first set. It’s the second year in a row a man from the U.S. made a breakthrough at Wimbledon. In 2017, Sam Querrey got to his first major semifinal in his 42nd attempt, the most on record. For Isner, Wednesday’s match was only his second Grand Slam quarterfinal. The other came back in 2011 at the U.S. Open. In Friday’s semifinals, he will see a friendly face across the net in No. 8 seed Kevin Anderson, a South African who saved a match point and came all the way back to stun eight-time champion Roger Federer 2-6, 6-7 (5), 7-5, 6-4, 13-11. ”He showed a lot of – what can you say? – gumption, I guess,” Isner said. ”We’ve known each other forever,” Isner said.